This paper considers the implications of the major changes in the labour market for economists over the past twenty years with respect to the private rate of return to investment in an Economics degree. The paper presents estimates based on Census data for 1986, 1991, 1996, and 2001, which show that the private rate of return to the degree has risen over time. Comparisons are made with two of the most likely alternative degrees, namely Business and Law. The results suggest that although students are less attracted to Economics degrees, these degrees have become financially more attractive, particularly relative to Business. The decline in the number of students studying for and graduating in Economics degrees is well documented, as are the reasons for this decline (see, for instance, Lewis and Norris, 1997; Maxwell, 2003; and Milmow, 1995, 1997, 2000). The decline began to occur in the early 1990s at a time when university places as a whole began to expand rapidly. Among the reasons put forward for the decline was the growth of, and subsequent shift from Economics to, Business degrees. In this paper, a Business degree refers not only to those generally described as BCom or BBus, but also the more specifically labelled degrees such as a Bachelor of Marketing and Business Administration. Business degrees were (are) seen as more career focused and leading to higher-paid jobs than Economics. This image permeates down to high schools where students are taking subjects such as Business Studies and Legal Studies as tertiary entrance subjects. Other reasons for the decline relate to the nature of Economics, with many perceiving Economics to be too boring, abstract, mathematical, or lacking interdisciplinary synergies. Lewis and Norris (1997) estimated that total enrolments in Economics degrees, including Economics majors in Business and Arts, fell by 13 per cent between 1991 and 1996. Their results were based on a direct survey of Economics departments in Australia. Comparisons with later years are difficult since the only published sources are the Department of Education Science and Training (DEST) student statistics, which only include in the Economics category degrees with Economics in the title, such as BEc or BAgEc. Historically, the number of universities in this category has changed but in 2004 there were 21 Australian universities offering degrees with Economics in the title. Some universities, such as the University of Melbourne, offer Economics degrees under the auspices of a Bachelor of Commerce, but these students are not included in the DEST numbers. The DEST statistics indicate that the decline since 1996 has not only continued but accelerated (Milmow, 2004). The number of students studying Business degrees doubled over the decade up to 2000 (Daly et al., 2003). A similar growth occurred in Law and Legal Studies degrees, another popular alternative to Economics, over the same decade (Daly et al., 2002). What can the rate of return tell us (and potential students) about the value of an Economics degree? For instance, are students' perceptions right, and does an Economics degree not provide a financially rewarding career? This paper attempts to shed some light on this by focusing on the private rate of return to university graduates in Economics and the two most likely alternatives, Business and Law. Australian evidence suggests private rates of return to university education in general have been sensitive to changes in the supply of, and demand for, graduates. It is difficult to compare calculations of private rates of return to university education from different studies because of variations in methodologies, but the broad conclusion of a comparison of Australian studies over time is that the private rate of return to tertiary education has remained high since the mid-1970s (see Miller, 1982; Maglen, 1994; Daly and Jin, 1997; Chapman and Salvage, 1997; Borland et al., 2000; Borland, 2001; Larkins, 2001). The most recent study by Borland (2001) used data from the ABS Training and Education Experience Survey 1997 to estimate rates of return to broad categories of degrees. On the base case assumptions, the private rate of return to a university degree was 14.5 per cent in 1997. (1) Borland (2001) found a higher rate of return for Business and Administration (18 per cent) and Engineering (19.5 per cent) degrees, compared with other degrees. 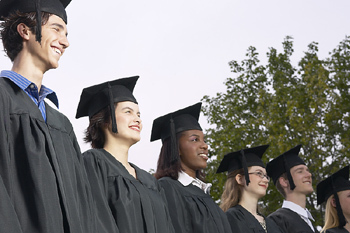 These results show that investment in higher education remained worthwhile for individuals. Business more than doubled over the decade. This rate of increase was much faster than for course completions as a whole. Available data--over a similar period--suggests that Economic completions have remained static or even declined and, in relative terms declined significantly compared to Business and Law. Millmow (2001) provides further evidence by a comparison of total student enrolments in Economics against the sister discipline, Business. Millmow's results are reproduced in Table 1. Exceptionally strong growth was experienced in the five years to 2000 in both Marketing and Management at 128.6 per cent and 91.2 per cent respectively. Total Economics enrolments have fallen, in contrast, by 8.5 per cent. In a labour market for skilled workers such as Economics graduates, experienced workers and new entrants may not be close substitutes. In the career-phase model developed by Welch (1979) workers with different levels of experience are not substitutes for each other. A large number of new entrants to the labour market competing for a limited number of entry-level jobs is expected to bid down their own wage, relative to those who are well established in the labour market. Alternatively, where relative wages are not flexible, unemployment is likely to rise among this group. Thus, this model would suggest that, ceteris paribus, the relative earnings of Law and Business graduates would fall or there would be higher unemployment among these graduates. For Economics graduates, where the number of new graduates has declined, earnings and job prospects generally would have been expected to improve for the new labour market entrants. The Graduate Careers Council of Australia (GCCA) publishes an annual survey of new graduates in the April following graduation. The results of the Graduate Destination Survey for Economics students are summarised in Table 2. Some 55.5 per cent of graduating Economics students in 2002 had found full-time employment, earning a median starting salary of $36,000 (GCCA, 2002). Compared to five years earlier, the relative prospects of Economics graduates have improved, with both starting salaries and employment rates now being better than for all graduates. The success rate of Economics graduates, as measured by the unemployment rates after graduation and starting salaries shown in Table 2, has substantially improved over the last decade, and is now better than for graduates in general. After high unemployment rates in the early 1990s, the prospects of Economics graduates have significantly improved. Graduates in general have experienced a similar cyclical pattern as Economics graduates, but have fallen behind, both relatively and absolutely. While in the 1990s Economics graduates had higher unemployment rates and lower starting salaries than new graduates in general, unemployment rates for new graduates are now lower and starting salaries are higher for Economics graduates. Although it might be expected that the major adjustment to a fall in supply of economists would be reflected in the market for new graduates, there would also be likely to be impacts on all Economic graduates, not just new entrants. Data relating specifically to the incomes of Economics graduates are available through the Australian Bureau of Statistics, but only for each Census year. (3) They are therefore based on self-reporting of the field of the highest qualification held. The economic downturn of the early mid 1990s saw the real median incomes of graduates in general fall, before bouncing back in the latter half of the decade. After falling to a low of $(2001) 50,008 in 1996, the median annual income of an Economics graduate in 2001 was $(2001) 62,192, above that of all graduates, and some $10,000 above Business graduates.